A gentle exfoliating all over body scrub with fruit extracts of Strawberry, Raspberry, Cranberry & Blackcurrant which has been formulated to be gently stimulating and exfoliating during the months of pregnancy. 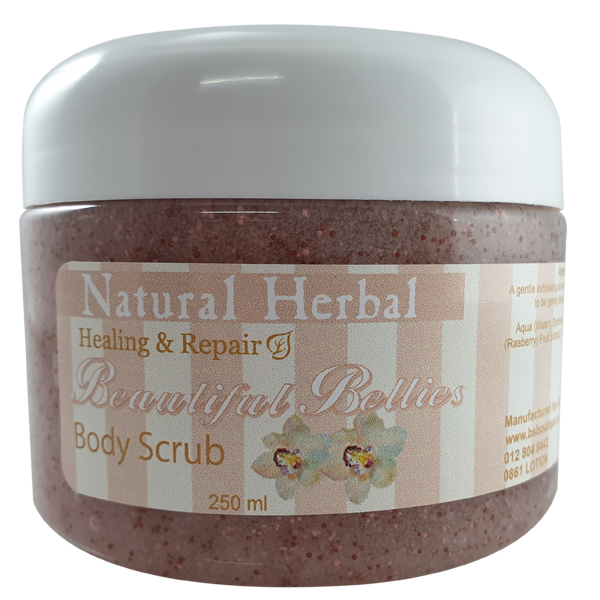 Healing & Repair Range Pregnancy Body Scrub incorporates Strawberry Fruit Extract which is known to reduce skin rashes caused by pregnancy, and having a high concentration of vitamin C it supports the skin to grow healthy & strong tissue, reducing the likelihood of stretch marks. Raspberry Fruit Extract has also been included as it is packed with antioxidants, known to reduce the damaging effects of free radicals. Containing tiliroside, it also inhibits the melanin production which reduces discolouration of skin. Blackcurrants Fruit extract has a high content of iron, which is needed in the production of good haemoglobin, aiding in the movement of oxygen through the body, and the antibacterial properties of this extract protects the skin from bacteria. Apply to moist skin and move in circular motions. Rinse with warm water.